Distant Hills Guest House provides visitors to the Highlands with stylish bungalow accommodation. 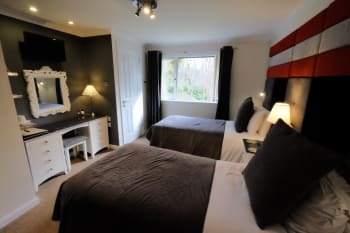 This AA rated four star gold guest house offers modern B&B facilities and delicious home cooked food in a quiet village location. 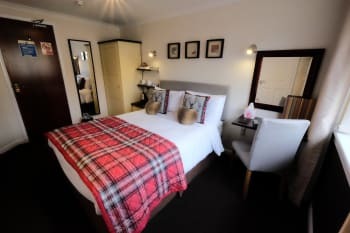 The guest house is located in its own spacious grounds on the edge of Spean Bridge but is only a five minute pavement walk from the village centre. If you enjoy sight seeing Ben Nevis and Loch Ness are 10 and 20 minutes drive respectively. A day trip to the Isle of Skye is one of the breathtaking drives in the area and perhaps exploring the beautiful beaches on the road to the Isles on another day. Distant Hills is the perfect place to relax after a busy day touring the Highlands. There is a large guest lounge with satellite television, selection of books, magazines and FREE secure wireless internet access throughout the building. There are no rooms available at Distant Hills Guest House for these dates. 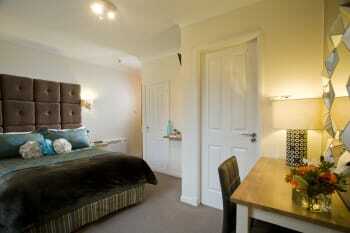 A well furnished double bedroom with ensuite, colour TV and tea/coffee making facilities. Our double beds are British standard size which is 1.37 metres wide by 1.90 metres long. Price includes breakfast which is served between 8 and 9. 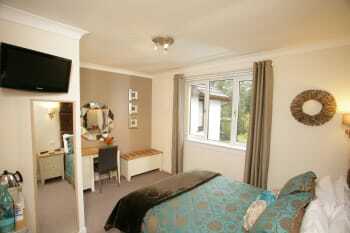 A well furnished twin bedroom (2 single beds) with ensuite, colour TV and tea/coffee making facilities. Price includes breakfast which is served between 8 and 9. Extremely clean. Excellent breakfast. Very welcoming hosts who really take time to make you feel welcome and ensure you have everything you need to make the best of your stay. Sets a standard of customer care that many seek but very few obtain. Very close to range of types of restaurants. We used it as a base for the Jacobite Steam Train, but it would make an excellent base for any type of holiday. Lesley and Peter are excellent hosts. Very appreciative of their guests and professional in all ways. 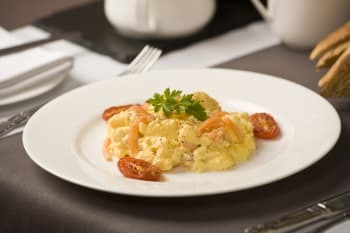 Their breakfasts are superb, and highlight some of the area’s most delicious foods that you won’t find anywhere else. While Fort William is close, don’t overlook places to eat in Roy Bridge, just up the road a bit. Call ahead to the nearby Spean Bridge restaurants and cafe for hours (limited) and confirm they’re open (“Closed”, surprise!). Excellent all round. Hope to visit again soon. The Jacobite steam engine trip is a must but must be booked in advance. Lovely quiet rooms. Fantastic breakfasts. Will definitely be back. Soak up the scenery. Visit the Nevis range for outdoor activities. Great for walking. A fabulous place to stay. The location is perfect for a trip out to Mallaig, Glencoe and surrounding countryside. Distant Hills is perfect - beautifully decorated and maintained and spotlessly clean. Peter and Lesley are very friendly and welcoming and serve up a breakfast second to none. I thoroughly recommend you stay here. Very comfortable and beautiful decor. So well managed, welcoming and friendly. Perfect. Had a two night stay at Distant Hills and thoroughly enjoyed it. The attentive, helpful and interested owners were wonderful and the rooms comfortable and clean. We were impressed by the packed lunches going out to the walking groups although we didn't partake in one ourselves. Good local knowledge and assistance meant that we had good meals both evenings at local establishments for which we were grateful. Plan ahead and get your evening meals booked, especially in busy periods. Watch the midges they bite in early June as well as the peak of summer! 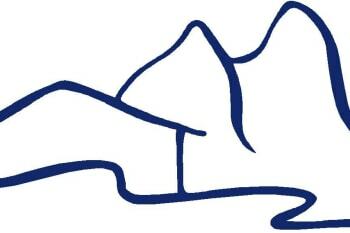 Accomodation is only a short drive to Fort William & Ben Nevis and supermarkets for main supplies. Local Spar close to Distant Hills and chippy if you want something quick to eat. Try Russell’s just along the road for a good feed. Excellent accomodation, lovely lounge for guests use, Breakfast excellent, overall attention to detail wonderful, spotlessly clean, hosts professional, smart, and attentive. Thank you folks it was a delight to have you here. Come back up from Devon anytime. This lovely guesthouse exceeded all our expectations! The rooms were well-appointed and comfortable, everything was spotlessly clean, and the garden was wonderful to sit in and watch the birds amongst the flowers. There was a beautiful guest sitting room overlooking the garden, and a cosy breakfast room where they served the best breakfasts of our trip. The hosts were helpful and friendly. 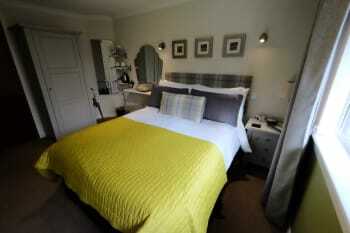 We could not be happier with our choice for staying in Spean Bridge. Outstanding accommodation, breakfast and service. I highly recommend staying here. Excellent, convenient location for mountain walking. Spotlessly clean, well appointed, outstanding service, excellent breakfast choices. Good location for touring the area. Fort William appeared to be the most obvious place to stay but it was almost fully booked and the cost was high. Five miles north takes you to Spean Bridge. An excellent central location for touring the area from. If you are planning to eat out, make sure you book ahead - Peter was very helpful with this. The Old Station restaurant was excellent. Really great breakfast. Very quiet room. Host was very pleasant . Absolutely excellent! Your reputation is thoroughly well deserved. Our French friends were entranced, especially by the quality of your breakfasts. They want to return ASAP. We loved the cable car ( télé féerique). An excellent place to stay. Peter & Lesley are lovely hosts and their knowledge of places to visit and places to eat is quite incredible. If we are ever travelling in the area again it will be a “must stay” . Peter & Lesley informed us of places to eat etc. Enjoyed our stay very much. Our hosts were welcoming, efficient and helpful in drying our clothing after a wet return from the hills. We appreciated their flexibility in providing an early breakfast on our departure morning. A very friendly B&B , very clean rooms great Beeakfast! The old pines Restaurant on A82 is great! Nice hosts with lots of ideas what to see and do. Very good breakfast! The Guesthouse is situated in Speanbridge - between Fort William and Fort Augustus and a good starting point for visits in this area. Lovely homely Guest House. Chocolate eggs were moreish I like the idea of Toiletry Wipes, cotton buds and cotton wool discs. We all had a lovely stay you were both very welcoming and very helpful. We would not hesitate to stay again. Wonderful place to stay. 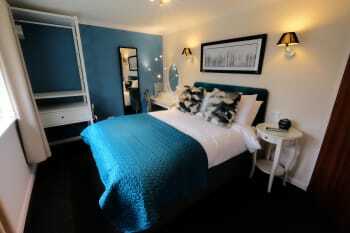 Peaceful setting, superb accommodation, very comfortable and stylish. Everything you could need and want. The addition of organic tea bags in the room was very welcome and the first place I have ever found this. Breakfast was the best I have ever had, totally delicious and a unique choice which made a lovely change from the usual cooked breakfast. Peter was very kind in helping us with sample menus for local restaurants, gave us the benefit of his experience regarding location and food served and even booked us a table at the restaurant we selected. Could not have been more helpful. This is a beautiful part of the world and well worth a visit. Cleanliness and attention to detail are outstanding. Recommend Distant Hills without any qualifiers. Distant Hills is a superbly run guesthouse. It is spotlessly clean, quiet and an excellent central base for exploring the Scottish Highlands and Islands. 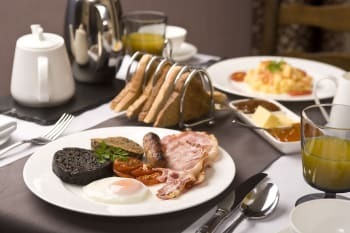 The breakfasts were a magnificent way to start the day and the Tunnocks Teacakes and Cadbury's Mini Eggs were just as good a way to finish each day. Thanks to Peter and Lesley for a great stay. We did three day trips from Distant Hills; a drive to Oban,a journey along the 'Road to the Isles' from Fortwilliam to Mallaig via beautiful Glenfinnan and a drive to the Isle of Skye via the Kyle of Lochalsh and a stop at picture-postcard Eilean Donan Castle. Early spring was a wonderful time to see the stunning scenery with the mountains still covered in snow. Extremely high quality breakfast and excellent service and attention from Lesley and Peter. Everything to hand that you could possibly need for a relaxing holiday. An abundance of walks in the locality and a good choice of places to eat. We ate at The Old Station Restaurant - A very good restaurant and pub conversion of the original station, with great gastro-pub food in a relaxed atmosphere. After dinner the pub turns into an ad-hoc music venue; loads of instruments are lying about and no shortage of well-oiled musicians to take them up. We used Spean Bridge as our first stop off on our highland rail trip from Fife. Distant Hills is a short walk from the station and an ideal stop on the West Highland Line (stayed on Skye the next day, then Plockton, then Newtonmore). We told you what a terrific time we had, and we really meant it. I cannot imagine a nicer place anywhere. I stayed in a hotel in Surrey last week (May 18th to 22nd) and the furnishings were shabby, the breakfasts were terrible, and they could take a great many lessons from you two. Thanks for such a lovely time and for taking such good care of us. If it's ever possible, I will come back. Helen Cameron, Guelph, ONtario, Canada. Peter and Lesley are the most welcoming hosts one could wish for. Besides the professionality, the cleanliness of the rooms and excellent breakfast, they are always interested in giving you practical tips for your plans for the day, or just a regular chat. Nothing is too much effort. The guest lounge is a lovely place to relax and our hosts made us feel very welcome in their home. 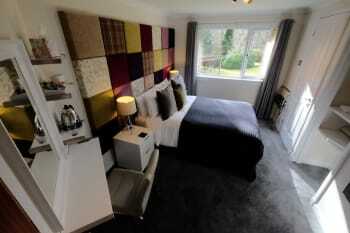 Bedrooms well equipped, breakfast choice superb. There are two good restaurants nearby: the converted Railway Station House for a friendly, bistro style meal, Russells if you want to push the boat out. Professional and welcoming! The most delicious breakfasts ever! Ben Nevis Inn near Fort William: a delightful spot, nice staff and good quality food. Day trip to Ardnamurchan: take the Corran Ferry and turn left. Single track roads, silence, wonderful nature. Visit to Castle Tioram near Acharacle: secluded and peaceful!